The questions will be set in Bilingual (English and Hindi). The maximum marks will be 125. The level of difficulty will be as per the educational qualification of the post. The will be of 10th Standard Level. There will be negative marking at the rate of 0.25 marks to be deducted for every wrong answer to eliminate the element of chance. ESIC reserve the right to introduce additional stage of examination which would be notified at the suitable time, if considered necessary. Candidates can get the ESIC Uttar Pradesh Syllabus 2019 in the below sections according to subject wise. 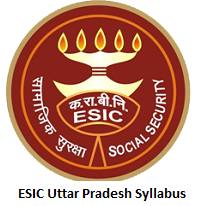 We had attached the direct link of ESIC Uttar Pradesh Syllabus 2019 in PDF format for free of cost. Candidate can bookmark our site that is Sarkari Recruitment to get more details on ESIC Uttar Pradesh Syllabus 2019. Metrology & Posology-Calculations of doses by age. Well, the above provided information about the ESIC Uttar Pradesh Syllabus 2019 is genuine and accurate. Any of the competitors are having doubts they can comment us in the below decision box. Thank You.